Adjusting to the changes in staffing over the last couple of weeks has presented challenges in meeting the expectations of our customers. Recent staffing changes reducing the number of working crew members to match American and Delta, has driven a level of focus on service standards. This focus is from not only our customers, but also from those of us who are finding it difficult to complete the scheduled services in a manner expected by our customers and consistent with the pride we take in our role as professional Flight Attendants. The changes to the Polaris service on many of United’s international flights are driving management to ask International Pursers to track the length of time it takes to complete the service by documenting how many minutes it takes, from the first drink served to the last desert served, and to report their findings using United Voices via the Link. We see that a number of you are doing just that. As staffing onboard the aircraft changes and Flight Attendant duties are redistributed to fewer of us almost to the point of task saturation, it's equally important for AFA to hear from you as well. JCBA Section 7.Z.2. 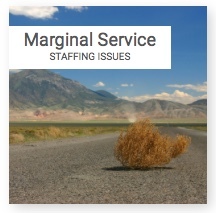 provides AFA with the ability to address any staffing issue that creates a marginal service condition. Examples include not being able to complete our standard practice work assignments within the allotted times. As we have previously communicated, there is a Marginal Service Conditions Report form on our website that has been designed to provide you with the opportunity to advise AFA of these conditions. What is essential is that all Flight Attendants, not just International Pursers, use the United AFA reporting forms(in addition to the company’s Voices app when applicable), so AFA will have as much documentation as possible when discussing these critical changes with management. The Marginal Service Conditionsreport should be filed any time you encounter a situation where the service provided to passengers is below standard or where you are unable to complete the service according to established service guidelines and/or within the expected time standards. Your report should include specifics about the situation, how it affected your ability to meet the company’s service standards and any adverse impact it had on our passengers. The Marginal Service Conditions report can be found in the Reports and Feedback Forms section of the website which is located in the Members Only area of the website (a non-public area). To access this area you will need to use your login and password. If you have forgotten your password you can reset it by accessing the Login Problems section of the MEC Website.